"And? What is she like, this Lady Renge?" Tamaki's eyes glowed, faint pink blush on his cheeks, smile as radiant as the sunshine streaming through his open window. It was ironic how his friend seemed to be so much more excited about the announcement than he himself was, and without sufficient reason. Then again, he was dubbed the Shadow King for a reason. Kyouya shrugged, reaching for his cup of tea. "Full of energy, much like you are." His curt response made the blonde ease forward, ever slow and steady, nearly at the edge of his seat, sugar biscuits forgotten and his own tea getting cold. When he realized that Kyouya had apparently no intention of continuing, Tamaki frowned - one more of a pout best suited for a child who had just been told that she couldn't have her new doll. He inwardly rolled his eyes. "You are far too stingy, Kyouya." The identical footmen snickered behind them. At that, Kyouya turned to regard them with dark calculating eyes, a smirk upon his lips. "Kaoru, you and your brother seem to be delighting over a particularly interesting joke of sorts. Would you care to share it with us?" Said older twin stood in attention, back ramrod straight, expression decidedly reprehensible, thusly, forgivable. Hikaru, on the other hand, with his piercing gaze and arched brow, begged to differ. Kyouya told himself then that he'd have to teach the boy a thing or two once Tamaki departed. His friend, however, always the peacemaker, could already read right through him. "Kyouya, they have just come into your employ. You cannot expect them to be flawless." "Anyone who comes into my employ understands the need to be flawless," he replied emphatically, crossing his arms, reaching to tilt his glasses upward. Tamaki sighed. "Whatever needs to be polished will be polished. You simply have to be patient." And oh, was patience not a virtue? Unfortunately enough, Ootori Kyouya had very little of it. "We have had this conversation before. Do you still think that I am being too stringent with the girl?" 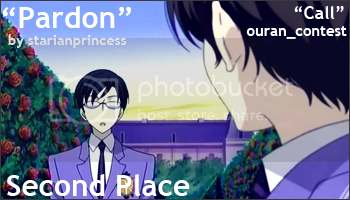 As to affirm his calculations,Tamaki readily nodded, gesturing to the beautiful waiting room they were seated in. Kyouya just knew that this visit had more to do with her rather than anything else. Suddenly, his friend's easygoing nature had vanished. It was a wonder how she managed to affect them both so. "You give her everything - everything she could possibly want. Yet, you forget to be sensitive enough to understand what it is exactly that she wants, and needs for that matter. You haven't even told her that you're now betrothed." She was his ward, a child left in his care because her father had been a good old friend. And at the time, it had been a fine idea. He'd had the time for it; he hadn't thought of what was to be invested in such an accommodation. But the gods of fate had played a sickeningly cruel joke on him. "That should be none of your business. And evidently, none of hers." Finally, he allowed himself to lie back, to give in to all frustration and bitterness. The nuptials were not for another two months, plenty of time to prepare them both. Not that he would admit he actually cared enough to want to prepare the girl. And it wasn't as if they had formed any kind of attachment to each other... had they? Now, he wasn't so sure. "Hikaru, please, would you summon my lady?" Tamaki's voice pierced through him like a bullet. And he would have ordered the footman to stay exactly where he was had Kaoru not instead opened the door to reveal her on the other side. "Ah... Haruhi," Tamaki breathed, uncomfortably pulling himself up to greet her. But the girl's eyes were fixed right on him, and it was making him want to gag. Nonetheless, the Shadow King did not move, waited while she curtsied and then took Tamaki's arm, the blonde leading her straight to him. His own demise. Thank you so much for reading. :) I tried my best to keep to their canon personalities, all the while incorporating a fanon background.